A new report that has been presented by Transparency Market Research states that the global market for field programmable gate array (FPGA) is expected to grow at a rapid rate with a stiff competition. Technological advancements and innovations in this field are likely to encourage the growth of the global FPGA market throughout the forecast period. In addition to this, the rise in the number of strategic collaborations and partnerships and the development of new products are predicted to enhance the development of the market in the coming few years. The rising number of applications and the enhancements in the products offered are likely to push the growth of the FPGA market in the near future. The key players operating in the FPGA market across the globe are Altera Corporation, Microsemi Corporation, Xilinx Inc., and Lattice Semiconductor Corporation. In 2013, the global market for FPGA stood at US$5,487.2 mn and is predicted to reach a value of US$9,734.4 mn by the end of 2020. The market is further predicted to register a strong growth rate throughout the forecast period. 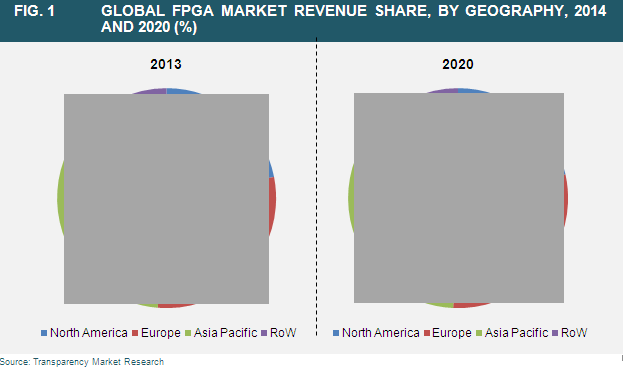 Previously, Asia Pacific led the global FPGA market and is estimated to remain dominant in the coming years. The rise in the contribution from South Korea, India, and China and the rapid development of the electronic industry are estimated to support the development of the Asia Pacific market in the near future. The rise in the demand for advanced driver assistance system is an important factor that is predicted to encourage the development of the global FPGA market over the forecast period. A substantial rise in the adoption of the Internet of Things is another factor that is likely to support the growth of the overall market in the coming few years. In addition to this, the increasing need for wireless communication is expected to offer immense growth opportunities for the market players across the globe. Furthermore, the key players in the global FPGA market are making investment for research and development activities, which is predicted to support the market growth and attract a large number of consumers in the coming few years. Moreover, the reduction in the time-to-market is likely to accelerate the growth throughout the forecast in the near future. These factors are likely to help the key players in expanding their product horizon, thus accelerating the market growth in the near future. The global FPGA market, on the other hand, is projected to face several challenges, which are projected to restrict the growth of the market in the near future. The absence of standardized verification techniques and the incapability of FPGA to substitute the basic devices are likely to restrict the growth of the overall market throughout the forecast period. Nonetheless, the increasing use of FPGA in data centers is anticipated to propel the global FPGA market in the next few years. The global FPGA market is expected to gain traction with the rise in the demand for hybrid and electric vehicle across the globe. The rise in the number of new players that are predicted to enter the market is estimated to enhance the market growth in the coming few years.